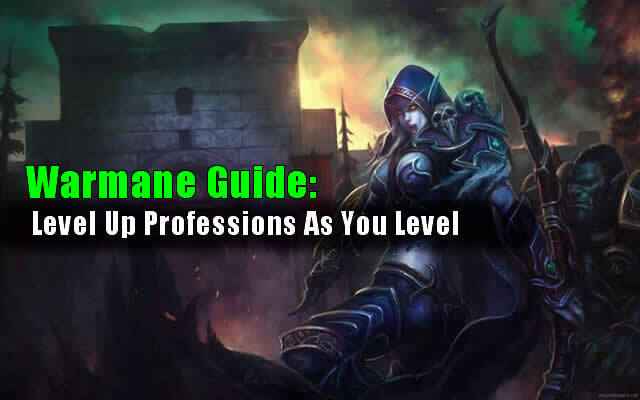 Level up professions as you level. Specifically, level up a profession that is appropriate for the gear your class would wear. So, for example, if you have a mage, you should level up Tailoring; if you have a Druid, you should level up leatherworking, and if you have a warrior, you should level up Blacksmithing. This goes for all the other classes and their respective gear types as well. You also should have your second profession be a gathering one that complements your crafting profession. For tailoring, it shouldn't matter, since you gather cloth naturally by killing humanoids; but for leatherworking, you should pick up skinning, and Blacksmithing, you should take on mining. The reason for doing this is so important in Warmane as opposed to retail is because of the XP modifier. Because you level up so quickly, and because dungeon finders are pretty much obsolete, you won't pick up much gear as you level. This leads you to find yourself too out leveled to gain XP from one area, but too under geared to efficiently kill mobs in the next area. By crafting your own gear, you're able to stay ahead of that curve and avoid many painstaking hours of running back to your body, because you didn't listen to this video's advice and make your own gear. And in case you didn't already figure out, having the gathering profession that complements your crafting profession makes creating your gear much cheaper. Game currency transaction is common in almost all MMOs including Warmane,. And there are quite a large number of players who want to buy cheap Warmane gold. If you are hesitating to choose the best place to buy Warmane gold, then U4GM is your best choice. Warmane Guide: How To Pick Outland & Medivh?